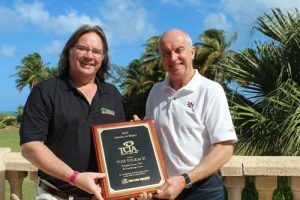 Tom Tolkacz, CEO of Swingle Lawn, Tree & Landscape Care, received the Tree Care Industry Association’s Award of Merit during the Winter Management Conference in Rio Grande, Puerto Rico. Swingle Lawn, Tree & Landscape Care CEO Tom Tolkacz was given the Tree Care Industry Association (TCIA) Award of Merit, which was presented during the TCIA Winter Management Conference in Rio Grande, Puerto Rico, in February. The award recognizes those who have devoted considerable time and energy to influencing and benefiting the tree care industry. A 30-year industry veteran, Tolkacz spent a six-year tenure on the TCIA board and played a major role in various initiatives, campaigns and task forces. He served on the association’s first ethics committee, volunteered on the TREE Fund’s board of directors and is currently involved in the TCIA’s workforce development efforts in Colorado, where he’s helping establish a new two-year arboriculture program at Fort Range Community College. Engage Agro USA added Todd Mason as North American key account manager. Mason brings decades of industry experience, including 10 years as a turfgrass professional. He’s worked as a regional manager in the distribution chain for John Deere, a territory sales manager for Arysta Life Science and a general manager for Turf Trade, most recently. PBI-Gordon hired Rian Aynardi, Ph.D. as manager of university and contract research for the northeast U.S. Aynardi holds a doctorate in Plant Pathology from Pennsylvania State University, as well as a bachelor’s in turfgrass science with a minor in plant pathology. SipcamRotam made seven personnel changes to “drive growth and meet organizational objectives,” according to the company. Doug Phelps was added as vice president of value added solutions. Phelps has spent the last 16 years with Horizon Ag-Products, most recently serving as vice president of sales and marketing. Amy Frasier was promoted to vice president of marketing. She brings more than 10 years of agriculture sales experience with DuPont Crop Protection. Marsha Fisher was promoted to communications manager and will support Frasier’s role as vice president. Bill Long and Reginald Young were added as account managers for crop protection sales. Long brings 13 years of agriculture experience with DuPont Crop Protection and 12 years with Griffin Crop Sciences. Young brings more than 25 years of experience with DuPont Crop Protection. Sam Wineinger was named account manger for the Midwest and Mid Central U.S. for turf and ornamental sales. Wineinger brings more than 20 years of industry experience, previously working as a golf course superintendent, a sales representative for Winfield Solutions and a territory manager for Arysta. Kelley Paris was added in customer service to support the additional sales staff. She brings customer service experience from General Mills and Wells Fargo. Davey Tree Expert Co. promoted Jim Zwack to general manager of the Davey Institute, the company’s research, development and innovation division. Zwack, who has more than 20 years of experience in the green industry, started with Davey in 2010 as director of technical services after leading a startup plant health care product sales company in Minneapolis. He has a master’s in physiology from Iowa State University and a bachelor’s in urban forestry from the University of Minnesota. Ruppert Landscape honored 23 employees at its annual awards banquet in Leesburg, Va. The company’s top honors are the Clyde Vadner Merit Award, which recognizes long-term dedication to the company, and the Achievement Award, which honors outstanding job execution and results during the previous year. Chuck Whealton, a regional manger who has been with Ruppert for more than 15 years, received the Clyde Vadner Merit Award, and Mike Felts, branch manager of the Maryland landscape construction branch, received the Achievement Award. Ruppert Landscape promoted Jennifer Saah to controller in its corporate office. Saah, who has been with Ruppert for more than a year, brings more than 10 years of experience in general ledger accounting, financial reporting and corporate accounting management. She holds a bachelor’s in accounting and economics from High Point University and is a Certified Public Accountant. Ruppert Landscape promoted Patrick Luzier, Mike Ward and Adam Bennett in its landscape construction division. Luzier was promoted to the position of southern regional vice president of the landscape construction division. He brings nearly 30 years of industry experience, starting his career at Ruppert in 1995. He’s served in various roles at the company, including branch manager in the Georgia landscape construction branch, most recently. Luzier studied psychology and history at California State University. Ward was promoted to branch manager of the Texas landscape construction branch. He began his career with the company in 1990 as a crewman. Serving in roles as diverse as foreman, estimator, project manager and more, he has held almost every position in the landscape construction division, the company said. Bennett was promoted to branch manager of the Georgia landscape construction branch. Prior to joining Ruppert in 2015 as a field manager, Bennett spent several years in the high-end residential market and masonry business. He graduated from The Ohio State University in 2001 with a bachelor’s in turfgrass management and landscape contracting.